This entry was posted in Current Affairs, Demographics, Economic History, Economics for the Jilted Generation, Finance, Fixed Income, Inflation, Musings, Politics. Bookmark the permalink. ← Can The Fed Taper? UK mortgages are also usually short term fixed rate or long term variable, unlike the long term fixed loans that make up the majority of US mortgages. A rise in rates would create a dual incentive for investors being offered higher yields in bonds while facing higher mortgage payments. Sure, that would be an incentive if interest rates were to rise. Personally, I’m not really convinced that rates will rise at all. I think the bubble could burst without rates rising significantly. A smooth transition from previous post about low inflation. Consumer price inflation has been relatively contained in Britain too, although we did experienced a more severe energy shock around 2011. I don’t see the London property bubble as evidence of inflation. I see it as evidence of the market acting irrationally. Inflation entails a general increase in price levels. This entails rentiers trying to make a quick buck. I do think the current depressed economy is spurring the hunt for yield. This is the same trend, really that spurred the 2011 bubble in gold — people trying to make money without investing in productive projects in the context of a depressed economy. Why irrationally? You interpret London real estate boom as a hunt for yield by exuberant crowd. But it may also be interpreted as pure rational spending. Low interest rates policy in major economies encourages debt-driven business model and pushes stock markets up. Hence the feeling of prosperity and the need to offload a few mil on a London apartment amongst “successful business people” from oversees. Cheap money that Fed et al are pumping into economy pops up in most unusual places around the world, and you see Russians and Chinese spending the spillovers in your city. Low interest rates is not a policy so much as a symptom of a depressed economy. Interest rates are simply the cost of money, and when lots of capital is idle — as it has been for the last five years — the price is cheap. Maybe the actions are partially rational to a limited extent. That is, in principle they may certainly be an increased yield over cash and bonds, and they may appear superficially safe. Yet a deeper analysis reveals that those higher yields come at huge risk. Far more rational is to engage in productive non-speculative activities that will produce a return. Yet to many investors these seem riskier than gambling on real estate. Yes the yields are currently impressive. But the capacity for getting burned is huge. Ultimately, markets are just aggregates of humans, and humans can be very stupid sometimes. That might be so, but what puzzles me is why the Fed keeps injecting 1 tril of $ per year into US economy when there is so much idling capital sitting on sidelines. And just the talk of reducing monthly injections by 20 or so bil $ sends the shock waves around the globe. That makes me think that Fed has something to do with the cheapness of money. Whether London real estate buyers are at financial risk is debatable. I have a feeling that this million they spend on a flat is not their last million. This is the class of people for whom “engage in productive non-speculative activities that will produce a return” is hardly an option. They are going to be fine whether prices to up 50% or down 50%, they just don’t care, it is pocket change for them. The Fed is trying to push investors away from safer assets like bonds and into productive assets like stocks. It is not as if the Fed is really injecting more capital into the economy, as it is taking capital out and replacing with zero-yielding cash. Personally, I am pretty sceptical of these measures in terms of actually yielding much productive investment. What we see instead is yield chasing. That is not to say that investors would not be chasing yield if it was not for the Fed. The depressed economy is real, and that does lead to chasing yield. I don’t think central banks are causing the malinvestment, but neither are they discouraging it. Sure, you’re probably right about this to some degree, but remember that a lot of HNWIs still engage in some pretty risky leveraged behaviour through corporate shells. While their personal fortunes may not be under threat from a bursting bubble, they can still cause a lot of damage to the financial sector and wider economy. The above statement applies only in a market economy. The cost of money now [for the BIG players out there is essentially ZERO], because there is no risk. Worse comes to worse, you just dump it on someone else and re-load. People do stupid things like buy bubble real estate because they couldn’t care less [it’s not their money]. It’s the poor slobs who use their own money who get destroyed when the bubble inevitably pops. Who are the buyers can afford the current prices? Mostly the rich foreigners? Bubble or not it’s supply and demand. London Real Estate may not really a bubble at all. Why? Because with so limited supply and the unlimited rich people worldwide pouring into London to buy London property in cash. Why shouldn’t London jack it’s price as high as possible to sell to the foreigners who have pile of cash to burn? Don’t worry too much about the burst of bubble in the future. This future may be far far away. London will remain expensive as long as more and more rich foreigners can come and buy until the British people want their government to set up restriction of foreign purchases. The burst of such bubble will hurt those who bought at the highest price. In this case, they will be the rich people who bought in the highest prices in borrowed money. Real Estate is alway about Location, Location, and Location. London is indeed the most exciting city in the whole world. it’s the prime location of the prime location of the world. It’s a grand wealth transfer scheme. Generally, governments brain wash their poor citizens to burden with more debts taken from the banks with bad debts. The house price cannot sustain its price because people wages at the bottom of the pyramid are stagnant. Moreover, the food & energy inflation has taken their spending power. This is nonsense. Most people born in london are trapped in london, they have no idea how to get out, other than moving a bit further out into the suburbs. They are a desperate captive population that will keep this cycle of exploitation going for a very very long time. Then of course you have all the other people coming from every corner of the UK and the rest of the world for some reason. The monstrous pyramid will continue to grow. Most people born in london are trapped in london, they have no idea how to get out, other than moving a bit further out into the suburbs. You can buy a 4-bedroom house in many areas of the country for the same as a studio in central London. This is not sustainable, especially given the convergence the internet is delivering. The crash could take another 3 or 4 or more years to materialise, but like the NASDAQ before it it will happen. do you know many Londoners who are thinking of moving out because they can just work via the internet? There might be a crash in the top end of the property market, but most of the market is held up by the irresistible gravitational pull of London on average people. That’s why Britain must build high speed bullet train rail. 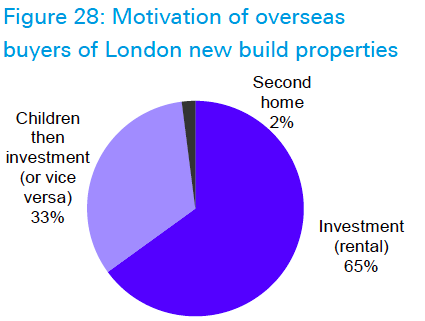 The servants can live farther away from London while the rich people live in the city. 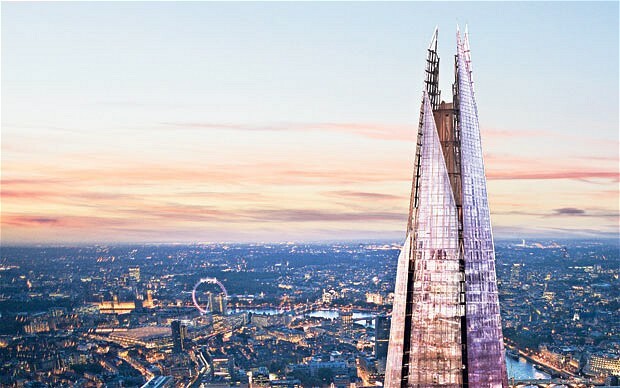 the Shard is a cross between Orwell’s Ministry of Truth and Sauron’s Barad-dur. I think that if any of the fallacies you mention begin to come unstuck to the extent that house prices begin to fall, the government will step in and interfere to prop things up. I’m not anti-government per se, but I don’t see anything from the three main parties to suggest they’d have the courage to do anything but try to maintain the status quo. What’s your take on the effects of building restrictions? “8. Why not build more? Well first, blame these guys. “So what’s the solution? Well, we can change the law. Why Europe’s Cyprus template of course: according to Rightmove, the “frenzy” of activity in parts of prime inner London is due to overseas investors who are looking for a safe haven to place their cash, which is “leaving the shelves bare.” This time round, the UK is seen as a safer bet, and of course the rich are going to continue to look towards this great European capital as an oasis of safety. Forget the theoretical and the hypothetical and speculate. Borrow as much as you can and buy as much as possible. I have made money around the world even borrowing on credit cards to buy property and shares. I am sure that will end well. The trick is to make sure it’s all borrowed money and you don’t give any personal guarantees. Take equity withdrawals from time to time. I think London is the prime site for luxury so It’s worth investing in it. Many would still want to live in here even on the highest rate so I don’t think there would be any bubble burst. London , Auckland in New Zealand , Toronto , Vancouver are great places to speculate. Even Sydney would be good. Only buy once it starts to go up. Forget about unknown places which have potential, renovations , or trying to be smarter than the market. Take the easy low hanging fruit and only buy if it is heating up. This is how speculators make money. It’s legal stealing. “Speculating” simply means that it’s not 100% rigged! It’s capitalism at work. A speculator takes on risk as any other entrepreneur. Like, I said, it’s legal stealing. very nice blog! I’ll be happy to look here every day. Stealing is a very strong word my friend. Risk management is a better term. If we live in a capitalist system we play by those rules. That is the reality. Speculators take on risk and provide liquidity to the market. Discount all these bubble bursting forecasters. They have never made a cent in their lives but quick with theoretical and hypothetical rubbish. Lot of people who have shorted bubbles have gone bankrupt while the market kept going up. Never bet against the market. You still make money by being wrong most of the time. The job of. Speculator is to make money whether you are right or wrong. Ramprastha group launches many projects in Delhi ncr Ramprastha rise, Ramprastha primera, ramprastha skyz, ramprastha view. ATS Greens is bobbing up with the new project at Yamuna throughway – ATS Ellur. ATS Greens goes to remodel a hundred Acres of land into A territorial division. ATS Ellur Yamuna throughway may be a project of size 6-7 acres inside the territorial division. ATS Ellur is giving two and three BHK high finish residential homes with unmatched amenities like club, swimming bath, youngsters play space, cardiopulmonary exercise track, yoga center, etc. ATS Ellur Yamuna throughway – A luxury accommodation could also be a heaven that offers you a golden probability to experience associate degree final fashion. a stunning experience could also be enjoyed at the sweetness of nature at leisure. Greetings, this is my first comment on this blog. Economic Destructionism is the new normal replacing Economic Inflationism. The terminal phase of Liberalism, began with Ben Bernanke’s QE1. The years 2009 through 2103 was the zenith of the paradigm and age that featured the economic action of increasing inflationism, where there was a Great Swell in balance sheet of the US Federal Reserve, fiat wealth, such as World Stocks, VT, and M2 Money, as well as Total Credit, where the goal of monetary policy was investment gain. Economic life centered around the investor and investment choice, and which carried impact in economic metrics such as increasing GDP, such as automobile production, and increasing employment in the financial sector; the latter were not goals, but simply statistical attributes associated with risk-on investing. On October 23, 2013, Jesus Christ opened the first seal of the Scroll of end time events, and released the Rider on the White Horse, as seen in Revelation 6:1-2, to affect a global economic and political coup d etat. His ride over the world PIVOTED the world from paradigm and age of liberalism into that of authoritarianism. With the bond vigilantes calling the Benchmark Interest Rate, ^TNX, higher from 2.48%, economic action, has changed from one of inflationism to one destructionism, where there is the “dreaded experiences”, specifically the death of fiat money, the death of fiat wealth, economic deflation, nation state default on Treasury Debt, economic destruction, disregard for personal property, disregard for person property rights, and disregard for people as persons. The Benchmark Interest Rate, ^TNX, that is the cost of US Treasury Debt, TLT, was formerly the Means of Economic Inflationism. But, with its rise from 2.48%, on October 23, 2013, it commenced the failure of trust in the monetary policies of credit stimulus of the Creature from Jekyll Island, and the economic policies of investment choice of democratic nation states. Now, The Interest Rate on the US Ten Year Note, ^TNX, is the Means of Economic Destructionism, establishing economic deflation and economic recession, terminating economic inflation and economic growth, and thus terminating the paradigm and age of liberalism, and birthing that of authoritarianism. As investors become entrenched in their new role of debt serfs they will be derisking out of debt trades such as Global Telecom, IST, like France’s, ALU, Finland’s, NOK, and Leveraged Buyouts, PSP, like the UK’s, DORM, and deleveraging out of currency carry trade investments like the UK’s, PRU, LYG, the Netherland’s, ING, and Ireland’s COV, CRH, STX, ACN, IR, MNK, PRIA, TRIB, and IRE. The result will create a global whirlwind of economic deflation and economic recession, like the world has never seen; something far disastrous than the financial bust of 2008. Competitive currency devaluation, is active in producing debt deflation. Monetization of debt is bearing its fruit. Japan’s Nikkei, NKY, led Nation Investment, EFA, lower. The Australian Dollar, FXA, led Major World Currencies, DBV, and Australia, EWA, and Westpac Banking, WBK, and Australia Dividends, AUSE, lower, as International Treasury Bonds, BWX, traded lower. Emerging Market Currencies, CEW, led Turkey, TUR, Malaysia, EWM, Indonesia, IDX, and Mexico, EWW, led the Emerging Markets, EEM, lower, as Emerging Market Local Currency Bonds, EMLC, traded lower. Greece, GREK, and the National Bank of Greece, NBG, led the Eurozone Nations, EWI, EWG, EFNL, EWN, EWQ, EIRL, EWP, EWO, and PGAL, lower, as Eurozone Debt, EU, traded lower. Aggregate Demand will be falling lower as a number of black swan events will cause Short Term Interest Rates to rise, resulting in Financial Apocalypse, that is a global credit bust and worldwide financial system breakdown foretold in bible prophecy of Revelation 13:1-4; these will be the genesis factors for the rise of regional governance and totalitarian collectivism. I hope you, and your readers will come by and visit my blog soon, as I continually strive to present both grace, meaning resource, and truth, meaning that which is reliable for belief or a trustworthy promise. publication date to be able to see whether it is unusual in the spirit realm and rejuvenate. body drifts out of favor in recent years. loading phase mkght not be essential to enhance musxcle creatine concentrations. number of different projects and duties through exhausted areas of countries throughout the world. of assistance via their non-profit assistance institutions. with the pressing difficulties that they confront currently. jointly with The Federation for Groups within the Yunnan area of China. The job started during 2005 and goes on all through now. in the Yunnan Area features to grow finances to help execute different projects across the area within poverty-stricken regions. giving specifics of transmittable sicknesses and many more. best and most effective impact with your color posters. The housing price bubble is beginning to inflate and the reason is due to demand and supply becoming equal only when the price is high. In other words the rate of building and of the availability of sites of land for this is lower than it might otherwise be. A sensible government will try to reduce this rise in prices by making more land available. There is some unavailability due to local government control, but in fact the largest amount of the natural opportunity is due to the land owners who are holding land out of use whilst its price rises. This land value speculation is exactly the reason why we had the financial crisis in 2007. Banks who led money to potential land owners think they know when they are on to a good thing with their mortgaging process, because it appears that this progress cannot fail to bring in the interest on the loan as well as its eventual return. A sensible government should tax land values and so put an end to land withholding, since this tax will no longer make land ownership without it being properly used to be worthwhile. I am surprised that for all the above comments nobody else seems to know what should be done to deflate the bubble tendency of our macro-economy for good. This is how. internationally and similarly they hold based clients all over the world. source that investmentinstances on the Lumber and Wood industry will probably be inspired to talk about.